I can’t think of anything new to say about riding Shafer trail into Canyonlands. I love it and it is a perfect day trip which you can learn more about from viewing my previous posts of this ride by clicking here or here. For fun, Sheila, Weldon and Storm help me play with the FXGuru app to act out the following fake meteor attack when we stop to take a break along the trail. Shafer Road joins the Canyonlands National Park road near the visitor center. 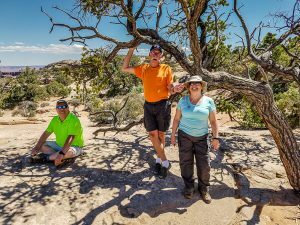 We decide to hike the short 1 mile round trip walk to Mesa Arch before we leave Canyonlands. From Mesa arch, we also view Washer Woman arch. The elegance of funerals. What chic and what décor! People now are dying as they never lived before.